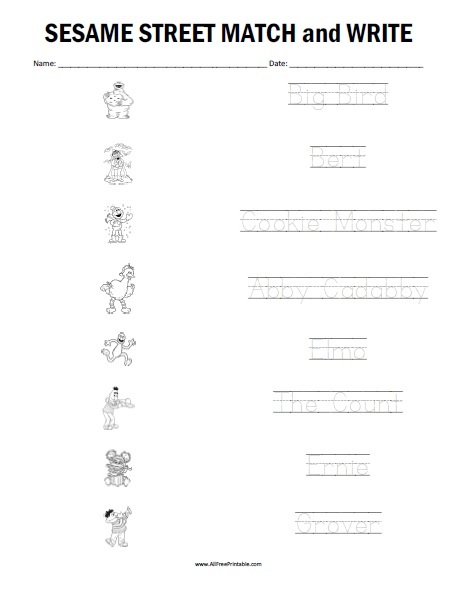 Free Printable Sesame Street Matching Worksheet. Free Printable Sesame Street Matching Worksheet, a fun activity game that you can use for writing and reading practice. Kids can practice writing skills and have fun matching favorite PBS Kids Sesame Street characters. Share this free printable Sesame Street Matching Worksheet at home, school, home-school, or tutoring. Your students can match the Sesame Street images with the correct name and then practice writing skills. Kids can match 8 names like Elmo, Big Bird, Grover, Oscar, Ernie, Bert, The Count and Cookie Monster. Print this Sesame Street Matching Worksheet free using your home or school printer and share with your students.